I have ben on the lookout for a Firefox plugin for Netvibes lately - simple things like adding a feed to my page (and being able to choose the tab perhaps? ), especially installing something in the context menu (read: right-click menu) to help me click on a link and add that URI to my dashboard. Sadly, I don't think such a thing exists. Instead, I found a ‘Add to Netvibes’ bookmarklet -- pretty cool. This is a service provided by netvibes that examines all the feed links on a page and gives you a list of subscription options. If you have a Netvibes account, you'll be asked to log in. 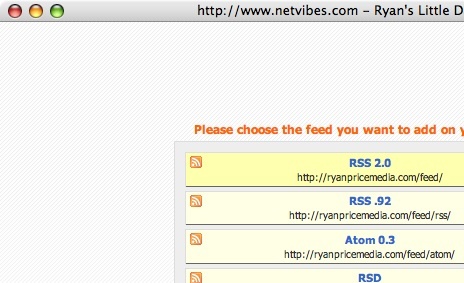 All of my blogs also have a handy "+Netvibes" chicklet as well. Just click and drag this link up into your bookmarks toolbar and you're all set!